Honeyman, Keppie & Mackintosh made substantial alterations to this mid-19th-century house. The exact nature and extent of their work is unclear, but it seems to have involved a new porch, the raising of the E. wing from one storey to two, and the addition of a parallel range of outbuildings to the N.
Authorship: Mackintosh was evidently involved in this project. The job-book entry is written entirely in his hand; a drawing by him for a new porch survives; 'Whistlefield' is included in his 1906 submission to become Fellow of the RIBA; and Loch Goil, presumably referring to this project which lies close to the mouth of Loch Goil, is listed among the locations of his domestic work in his entry in Who's Who in Glasgow 1909. 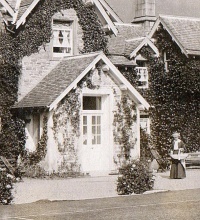 However, the porch as built is in the same traditional style as the original house, and so, to judge from old photographs, was the demolished E. wing. If Mackintosh designed these additions, their unadventurous appearance may reflect the client's wishes rather than the architect's. Alternative names: Ardarroch, Finnart Ocean Terminal . Cost from office job book: The job book records successful tenders for mason, joiner, plumber, plaster and slater work amounting to �1818 5d 0d. The payment of over �22 15s 0d in measurer's fees suggests that this quantity of work was actually carried out, but payments to tradesmen and suppliers recorded in the job book amount to little more than �100. The likely explanation for this discrepancy is that Brooman White paid the contractors directly.